28-inch W 17.5 cu. ft. Top Freezer Refrigerator in White - ENERGY STAR® Your 17.5 cu. ft. Top Freezer Refrigerator in White is ENERGY STAR certified, and features upfront temperature controls and adjustable racks. GE appliances provide up-to-date technology and exceptional quality to simplify the way you live. With a timeless appearance, this family of appliances is ideal for your family. And, coming from one of the most trusted names in America, you know that this entire selection of appliances is as advanced as it is practical. 28-inch W 17.5 cu. 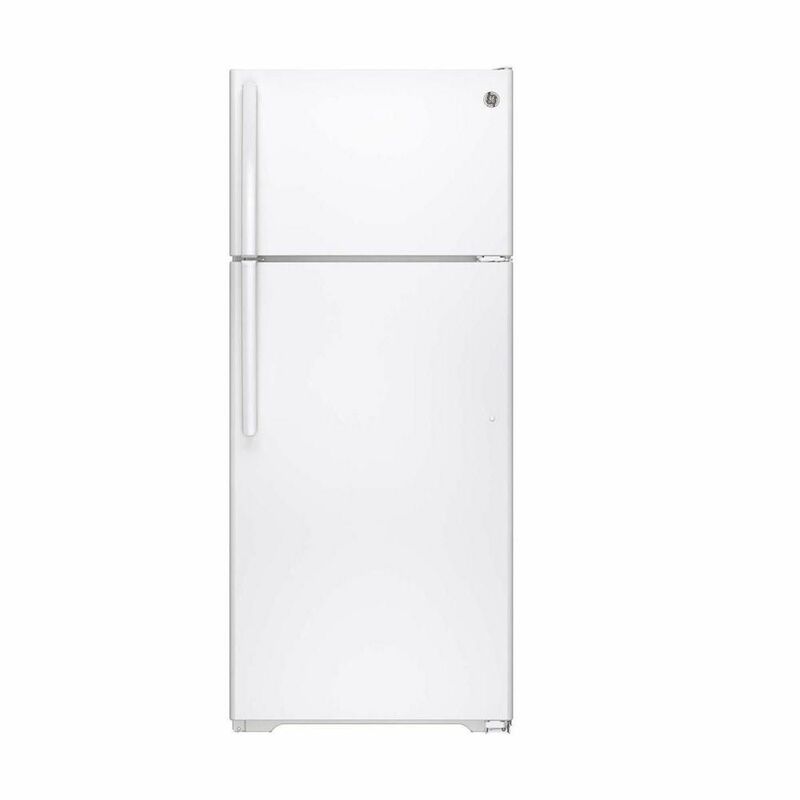 ft. Top Freezer Refrigerator in White - ENERGY STAR® is rated 4.2 out of 5 by 143. Rated 2 out of 5 by Reba19 from Very, very, very noisy! We needed a small refrigerator for garage use. It seems to be working okay, but it is VERY noisy when it's running. If I had purchased this for my kitchen, it would certainly be returned...entirely too noisy for in home use. Rated 5 out of 5 by BaabzKell from Love my GE! Its has everything we need and more! I love my refrigerator! Rated 4 out of 5 by rebelgirl6713 from Very nice!! Keeps everything evenly cold. Easy to keep clean, inside and out. Rated 1 out of 5 by Lyle45 from None No ice cube trays provided no meat drawer very noisy, cannot change temperature on freezer without setting the same on refrigerator. Rated 4 out of 5 by Steve127 from Great product Just got the product last week, and it is working great so far. Easy to use and compact.